In the early days each member club of the Association hosted the Annual Conference in turn with the host club's chairman in the "chair". The first three conferences involved just three clubs, London, Manchester and Birmingham. At the third meeting in Manchester in 1962, a fourth club had appeared but for some reason was not formally accepted into the Association until the following year. This fourth club was North Staffs which hosted the fourth Conference in 1963 at which itself along with four other clubs, Liverpool (now called Merseyside), Nottingham, Oxford and Reading (now called Thames Valley) were admitted into the Association. In these early days it seemed the host club picked up the bill (Ed. for Conference) since one item discussed was reimbursement of expenses to the host club. The first Association Secretary was elected at this meeting - which in certain ways was the "birth" of the Association as we know it today. At this meeting a "fund" was proposed and the levy discussed. During this year "AIVC News" [Newslines] appeared. The next meeting at Oxford agreed on a levy of 6d [old pence]. The practice of hosting the Annual Conference by rotation seemed to have continued at least until 1970 when Liverpool hosted for the second time. 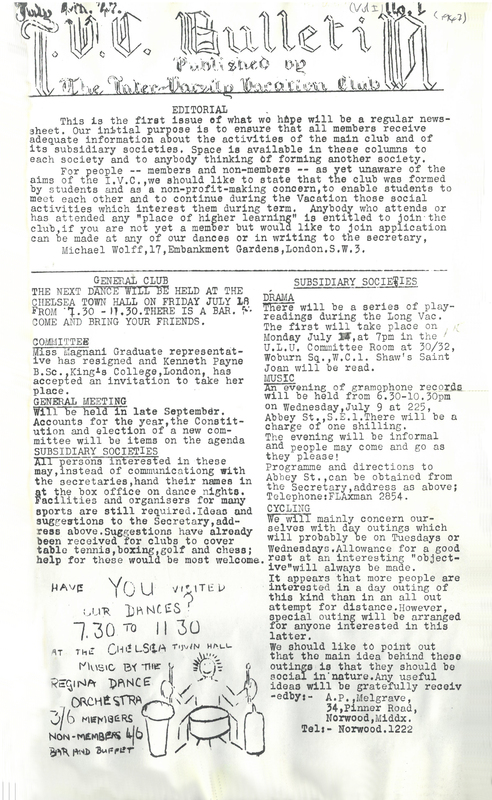 Note that Nottingham organised Conference in 1965, 1975, 1985 and 1997. This makes them the only club to have hosted Conference four times. But we should be fair about it. Many clubs, even quite large ones, have never hosted. No need to mention any names. They themselves know who they are! There is no reason why any club cannot host Conference. You get all the help you need from the AIVC Committee. Certainly it's a lot of responsibility, but in terms of workload, it's much less involved than an ordinary AIVC Weekend. With the Conference, you pay someone to do all the work. You give instructions and they must produce the goods! You can make a Conference work with only a small handful of helpers. In recent years the practice has been to employ a professional secretary to take the minutes. So even that task is taken care of. Colin Jackson [C.J. to his friends] said he was a "one man band" and it worked quite well. One of the smallest clubs ever to organise Conference was Fylde with only 66 members in 1979. I remember it well! Fylde must have been quite a young club at the time - just out of short trousers or even younger! There was a reception attended by the Deputy Mayor of Blackpool, a ceilidh in a German Beer Keller and to round off a splendid Saturday night - a ride back to the seafront hotel in an illuminated tram. So any volunteers for 2020 and beyond?